When an elderly person goes into hospital it’s often at a crisis point – perhaps after a bad fall or during an acute decline in health. The care that older people receive is, sadly, not always as good as it should be. If your relative is currently in hospital, you may be coming under increasing pressure to get them out and into a care home. However, the correct NHS Continuing Care assessments may not have been done. 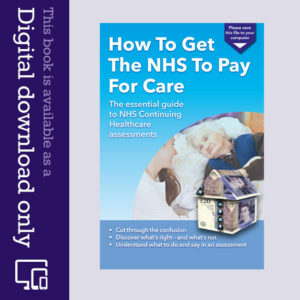 Make sure the assessment process is complete before being discharged from NHS care. A holistic approach to elderly care is vital, and yet many families report that there seems to be little joined-up thinking in the care system, particularly in hospitals. Elderly people usually have several overlapping health needs, and treating one problem in isolation simply causes other aspects of health to deteriorate. Elderly people are vulnerable and can quickly become dehydrated and malnourished. It’s also not uncommon to hear about people sustaining broken bones falling out of bed in hospital. Such a disjointed approach not only causes untold distress to the patient and their family, but also wastes millions of pounds of tax-payers’ money – every day – in preventable re-admissions and ongoing problems. If you’re under pressure to get your relative out of hospital and into full time care, make sure the proper health needs and funding assessments have been done first. If your relative needs ongoing full time care you will almost certainly be told they have to pay for it. This may not be true. Read the articles on our blog about the hospital discharge process and Continuing Care assessments. Many elderly people go from hospital straight into a care home, and yet families often receive very little information or guidance about how to choose the right care home for their relative. 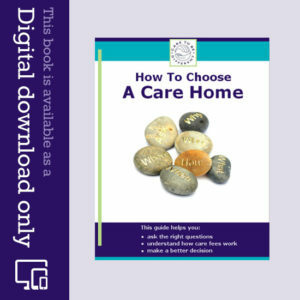 This 39-page practical guide helps you ask the right questios when you’re looking for a care home. It means you make a better decision, you save a lot of time – and you avoid unnecessary care costs later on. Read more..
I’m so weary I’m considering saying forget any funding and getting a loan to pay for private 24hr care in home for her final weeks, just to grant her wishes. We’re so caught up in trying to sort this we’ve no time for mum personally to absorb the terminal diagnosis. No time to make the neccessary adjustments to her house. I’ve made freedom of information requests as to the amount of people receiving 24 hr care in the local region on CHC but mum will maybe dead by the time that comes through. She has limited capacity (i.e some days she’d pass some fail) and they’re holding that as a trump card in case we push too far i suspect. We’ve never seen any Mental Capacity Assessments (MCA). Has anybody had vaguely anything similar? My mum has what the medical staff are telling me “variable or fluctuating” capacity we roll the dice with it. We had our Fast track /best interests meeting on Friday which I just wanted to get through so they’d put theFastrack form in. Thankfully my mum had capacity on that day though they weren’t sure she’d retain the information so they’re allowing her to go home. They’re still absolultely insisting there’s no more than 4 visits per day and 4 nights per week with family plugging the gaps – and even with Fast track their providers are that stretched it has taken 3 weeks to put the more complex care packages in place……I advised them that I could have a 24 hr comprehensive package in place in 48 hours. It all falls on deaf ears as I thought. Application with the CCG now so I’m glad to be at least at the horse’s mouth now. Not one member of staff I’ve spoken to so far knows the national framework or its obligations. Nurses, caseworkers, GP’s, palliative care. Not one. So crazy. I guess the question is what have they assessed her needs as being ?if its 24/7 care they have to fund. Suggest referring head of local CCG to safeguarding ……. So here’s the ridiculous situation to finale I’m presuming. Mum assessed at needing 24 hr care. She chooses to be released home from hospital. (she had capacity on the day she made that decision) but her capacity is variable as they describe. Can’t go quite yet as we’re having to transform her house into a downstairs living area quickly and awaiting equipment ( not had a visit from occupational therapy yet even or hospital bed ) now hospital desperate to discharge her and CCG are still only giving us 4 visits per day and 4 night sittings per week to care for her. We’re having to pay another care company (or the same one the CCG will put in place to minimise the sheer amount of exchange of personnel if I can coordinate it) to fill most of the hours in between these times. We’ll end up paying as much/ more than the NHS are funding for her care at home! All complaints and protests have had no effect. CCG, social services, nurses, GP, discharge team, caseworkers, I’ve spoken to every single person I could find. All give the same story and if you push and push they allude to the fact you’re trying to leave a vulnerable woman without care and that’s terrible……wilfully or ignorantly not getting that it’s not me who’s attempting to shirk my obligations. All this has eaten away at the time we have left and the time spent embroiled in this has delayed her discharge further as we now need to chase up equipment and make her house suitable. No occupational therapy visit planned and we’re just told she’ll come home with the equipment she’s using when we asked what was needed at home. We can’t even pitch in fully with her personal care as children as she gets incredibly upset and embarrassed if we help her. My hope is (as she is deteriorating now mentally with cancer in the brain) that we get her home as she wishes and she knows she is there until she may qualify for a hospice bed in her final weeks/days. Thanks for all your help and support as we’ve not any from anyone else. The only compassion we’ve experienced since she entered terminal phase in hospital has been from the ward staff. We’ve been told my mum doesn’t have full capacity for complex decisions and that they’d only release her home with 4 carers per day and twilight nurses but there’d still need to be family members to plug the gaps in the day with a family member present during the whole night!!!! Won’t release her home without this. Who is funding this ccg or LA? Further info, they (palliative care nurse and community liason nurse) say mum had capacity assessment to ascertain she can’t make complex decisions. Very odd. She’s most aware she needs care at home. They also called the CCG during meeting to check 24 hour funding when we queried that there was no capping and the CCG said they wouldn’t fund it. So annoying. I’ve sent a Freedom Of Information (FOI) request and we’re panicking as to get her home I’m going to have to leave my job, house (and husband) move 130 miles to move in with mum as a 24 hr Base for the carers the NHS are willing to provide 4 times per day. Mum’s still languishing in hospital, miserable. I don’t know if well be in a more powerful position at home or who to pressure first to get quick results before they force her into a home which she will be utterly bereft about. Many thanks Richard, she’s got capacity, been fast tracked and I’ll put in the research to back us up as she’ll definitely need night visits as they’ve hinted. I’m so glad I found your site! Currently my mum is in hospital after falling and taking a turn for the worst (she has stage 4 terminal lung cancer with spread to the brain, liver and spine) given 8-12 weeks now as tumours growing back and brain ones giving her confusion, balance and incontinence issues. Hospital initially just attempted to discharge her without any referrals or assessments. She desperately wants to return home but now needs probably full time care. had no contact with case worker yet but palliative care nurse in house said she was “unsuitable for a hospice bed, yet” they’re attempting to corral her into a care home which she doesn’t want and say the maximum home visit allowed is 4 visits per day which they say is unsuitable as she’d be straight back in hospital……Am I right in thinking NHS care would/should provide 24 hr or at least more comprehensive care at home if she wanted it? Hello, im just wondering if any one could give me a bit of advice on what to do next where we stand really. my nan has dementia of many different forms. she was in a care home but had falls and they just couldnt cope with her she was very demanding, she went to hospital then we found her another care home, one that would take her as a couple wouldnt as they didnt think that they could cope. She had quite a few falls again and was taken to hospital then let back out again, then had a fall this went on for a couple more times, then the care home re-assessed her and said they would not take her back. the resson for this is that she just wants to keep getting up and down all the time her mind is telling her all the time to get up and move about but her body just wont do it anymore she gets up and can still wait bare just then she falls backwards. she is in hospital now and she is on a buddy system so on her note etc it is said she needs one to one 24/7 the hospital discharge now has a new care manager has given my family a choice of three nursing homes that she could go to, when we looked into this one care home it wasnt for dementia at all. the other assessed and wont take her as they cant offer one to one. it seems that no one will take my nan because of the one to one requirement. what do we do, please can anyone give advice because we dont know what to do anymore. now my nan has got MRSA as well. thanks to anymore who could help. there is no money to be able to go private and shes not able to go home. Thanks, Angela, that’s a good starting point for us. If you are going to an interim or intermediate placement watch out for the scam that your relative doesn’t qualify for this when they clearly do.